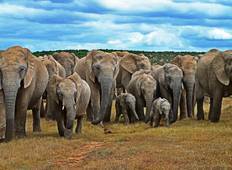 Find a Adventure trip that explores Addo Elephant National Park. There are 45 tours to choose from, that range in length from 3 days up to 93 days. The most popular month for these tours is September, which has the most tour departures. "Well organized, professional tour guide , "
"Loved every moment of it. Machiel is the best." "All time great trip, can’t recommend enough"
"I didn't really know what to expect as this was my first solo travelling experience..."
"Fantastic trip, our guide Maudi was so helpful and fun and everything ran very smoothly...."
"I have just returned from Sunway South Africa Rainbow Route tour (17 days). It was..."